From the waters of the Aegean, to capitals from Athens to Ankara the battle lines are being drawn for 2016's contest between migrants seeking to reach Europe and those who would stop them. While, even in the first few days of this year, thousands have shown themselves willing to undertake the perilous journey, with dozens of lives already lost at sea, there are signs that a whole battery of measures planned to restrict the traffic in people is starting to have an effect. This week Frans Timmermans, Vice-President of the European Commission, has been in Turkey to discuss how €3bn (£2.25bn) promised last November to limit the migration will be spent. UK Foreign Secretary Philip Hammond is expected to discuss these and security issues later this week. A range of measures, from stepped-up patrols, visa restrictions and rule changes designed to make deportation easier seem to have changed the atmosphere. "We have given up on this," a 23-year-old Syrian who we'll call Ghassan told me by phone from one of the Turkish ports. "We have tried too many times and failed - and also I am thinking again about Europe and whether we are really welcome there." Ghassan and a friend from Syria entered Turkey in November and have since tried three times to cross the narrow waters between that country and one of the Greek islands. Twice the Greek coastguard caught them and disabled their smugglers' boats, once the Turkish authorities intercepted and turned them back. So what do Ghassan and his friend plan to do now? "We will stay in Turkey legally and study," he said. EU funding to boost education for Syrian refugees will soak up a significant part of the promised cash, Mr Timmermans said in Ankara on Monday, adding he was awaiting a list of projects for funding "so Syrian children can go to school". Europe is also pressing Turkey to grant more work permits for Syrian refugees. Of course, these measures will take time, and steps to increase the appeal of staying in Turkey are only part of the picture. Frontex, Europe's border agency, in December deployed 15 patrol vessels to assist the Greeks in catching people smugglers, and a more muscular follow-on, the EU Border Force, is intended for deployment later this year. 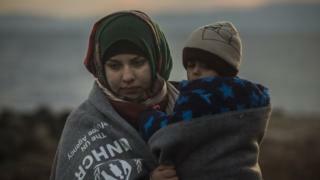 Even so, plenty of people are getting through, though the winter weather and new measures have reduced arrivals in the Greek islands to around half of the 2,700 per day average for 2015, and about one-fifth of the 7,000 who got through each day as last year's migration peaked in October. Despite the reduction, with arrivals in Greece still continuing at well over 1,000 a day, Mr Timmermans said last week that Europe was "a long way from being satisfied" with Turkey's actions. Further enforcement measures are under way, with raids stepped up on Turkish hostels where those seeking a crossing to Greece wait, and preparations being made to detain more of the non-Syrian migrants. Turkey has also just scrapped a scheme whereby Syrians who entered from third countries (such as Lebanon or Jordan) could do so without visas, as a means of trying to stop the country being used as a thoroughfare to Europe. While Syrians still make up the biggest single group trying to use this route to Europe, the picture is changing as new measures are put in place in Turkey. A Turkish journalist we sent to speak to people waiting in hostels around the Aegean port of Bodrum reported back: "Many of them seem to be Afghan and Pakistani." This impression is confirmed by statistics from the International Organization for Migration, which indicate 37% of the thousands who arrived in the Greek islands during the first few days of 2016 were Afghan (compared with 21% in 2015), 12% from Iraq, and 6% Iranian. The flow of those seeking a new life in Europe has not only fallen, for the time being, but it also seems fewer Syrians are attempting the journey. In addition to the measures focused on Turkey and the Aegean, Balkan countries continue to tighten their border controls. Viktor Orban, the Hungarian Prime Minister and Europe's leading hawk on immigration issues, this week proposed that a new fence should be built along Greece's northern border in order to cut the route through Macedonia taken by many of those who move on from Greece's immigration facilities. In 2015, about 850,000 migrants crossed into Greece via Turkey, with the Turkish authorities detaining about 80,000 people in the attempt (it is not known how many of that lesser figure got through on subsequent tries). This year, the aim is to cut substantially the number crossing and improve the efficiency of border enforcement, an enormous and multi-faceted task. If, when finer weather returns to the Aegean in spring, fighting intensifies in Syria as well, the numbers could easily swell once again. But now there are so many different measures being tried and enormous resources applied to prevent this happening that many may conclude, as the Syrian refugee Ghassan did, that the journey to Europe is just not worth it.